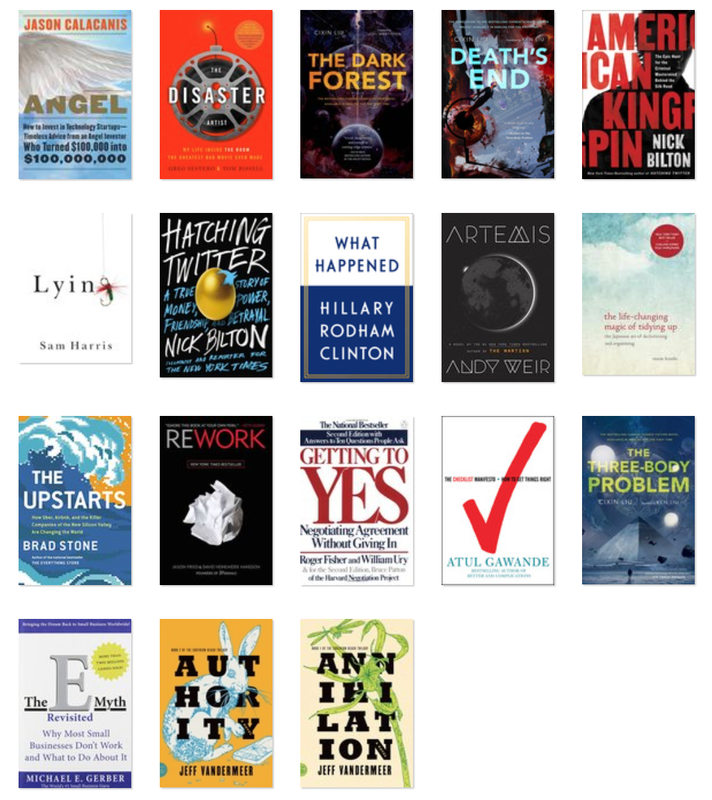 I ended up reading 18 of my 26 book goal this year. I chalk this up to listening to too many podcasts and being in business school where we read portions of many books and tons of articles. I will try to get back to the books in 2018 and listen to fewer Pocket articles and podcasts. I have written notes on some of my favorites below. My favorite book of 2017. Amazing and well told entrepreneurial story. More non-ficiton writers should copy Nick Bilton’s style. It is as entertaining as reading any fiction. Nice quick read on the value of being honest. Wish more people operated this way. A bizarre and entertaining story. In a weird way I admire the drive and boldness of Tommy Wiseau. He brought his vision to life when no one believed in him. Nowhere near as good as The Martian, but still entertaining and original. Great actionable advice on angel investing and a pretty entertaining read. I hope to put it to use in the future. I was curious to hear how HRC reacted on the night of her loss and I couldn’t help reading this. I have spent way too much time reading articles about Trump and election this year. It is a guilty pleasure. I suggest the audiobook where she reads it herself. It feels like an extended podcast. Great concepts around thinking of a business as a series of processes. Small business owners that believe their business wouldn’t survive without them should read this immediately. The made up stories are kind of annoying though. I generally avoid self-help books, but I do think decluttering can dramatically improve your life. Choose what to keep, not what to get rid of. +1 star for being short. Nice actionable business tips in an appropriately short book. About as interesting as a book on checklists can be. Takeaways: checklists are a great compliment to the falliable human brain, don’t get surgery unless you absolutely have to. Great primer on negotiations. Covers many of the topics we discussed in class. I read this immediately after finishing Nick’s American Kingpin. He is a fantastic writer of non-fiction. A good read on the dysfuntional company and amazing creation that is Twitter. I thought I knew these stories pretty well, but this goes to another level of detail. It is an inspiring read and feels like the first chapter for these companies. Much better than the first book. Some very clever future inventions. After watching the trailer I had high hopes for the trilogy, but I was dissapointed. The first book was pretty good and the second was pretty horrible. I am still looking forward to the film.